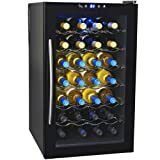 The NewAir AW-280E thermoelectric wine cooler lets you keep your collection at the ideal temperature for perfect taste every time. This wine refrigerator holds up to 21 standard bottles of wine. 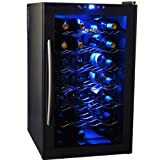 It looks great in your office, home wine cellar, kitchen or wet bar. Cooling System: The quiet and vibration free thermoelectric cooling system allows you to set the temperature as low as 54 degrees Fahrenheit and as high as 66 degrees Fahrenheit while protecting sediment. Digital Display: Quickly monitor and set temperatures with ease using the push button controls mounted on the door frame. Interior LED Lighting: Cool blue LED lighting is included to better illuminate your collection. Adjustable Shelves: 6 chrome plated wire shelves pull out to make for easy bottle loading when needed and convenient accessibility. 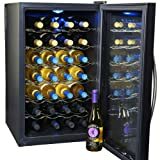 Interested in the NewAir AW-280E Refrigerator, 28 Bottle Freestanding Chiller Fridge Wine Cooler Black? Is the price too high? You can easily price watch this product and we'll notify you when the price reaches your target.